The SporTrak Pro (Ver. 3.01, with a NA Marine 1.05 base map), about $250US (check prices HERE), appears to be a Magellan Map 330 (see review HERE) packaged in a more ergonomically pleasing package, and is 14g lighter. Named keys are replaced by symbols. The screen resolution is the same (see HERE), but the Pro screen is a little whiter, more visible, and the 2-step backlight is brighter. The keys are smaller and not quite as easy to use. The Pro has the same operating system as the Map 330 with the addition of a 3-D "Road Screen" which is the same as in the Meridian Gold (see review HERE). waterways, airports, parks, fixed navaids, buoys, lighthouses, marinas, and obstructions. The SporTrak Map comes standard with a base map consisting of cities, highways, airports, waterways, and parks. The SporTrak Map base map is the same as the Meridian GPS base map. The 330 contains Cities, Highways, Airports, Waterways, and Parks. The Pro has these and adds Fixed Navaids, Buoys, Lighthouses, Marinas, and Obstructions. The Pro memory includes 9MB of base map and 18MB for uploadable maps. This compares to the 330's 8MB of base map and 8MB of uploadable map memory. The SporTrak Map has a 2MB base map and 4MB for uploadable maps. NOTE: The new MapSend DirectRoute maps will provide more accurate maps plus provide automatic routing. The 330 (which has been loaded with MapSend Streets USA) has a sub menu, "Map_330" which contains, Address, Streets-Roads, Waterways, and Parks. The Pro (which has been loaded with the optional MapSend Streets & Destinations USA) has a sub menu, "SporTrak_Pro" which contains those of the 330 plus 21 NEW classes of POI from "Aerial Activities" to "Zoos & Aquarium". The street maps appear to be the same. This database contains the recorded waypoints, and can be sorted by Near Position, Alphabetical, or Near City. To find a waypoint in the alphabetical list, one must scroll through up to half the waypoint list which can take some time. There is no "spell matrix" as is with the City list. Waypoints have an 8-character limit, but can be either upper or lower case plus punctuation. The Pro has a capacity of 500 waypoints, and up to 204 waypoints can also contain "Messages" of up to 30 characters. The Sportrak Pro GPS appears to represent a significant step forward in WAAS enhanced GPS position accuracy. In experiments the Pro was able to achieve 95% confidence accuracy of less than one meter on two out of the three tests we made in the open. It also achieved its specification accuracy of 3 meters 95% of the time under moderate tree cover on all tests. No other consumer handheld GPS we have reviewed has achieved this accuracy. Other tests show that this stationary accuracy is not achieved at the expense of position lag at highway speeds or in overshoot on sharp turns. We consider the Sportrak Pro to be the most accurate consumer GPS receiver that we have reviewed. Magellan Engineers have confirmed that our results are consistent with their data though they do not GUARANTEE accuracy to the level we have experienced in our review unit. Subjective evaluation of the sensitivity would be that it's above average. The most dramatic results of the Pro's performance was under moderate tree cover. Magellan seems to have overcome this general problem with hand-held receivers as can be seen in these plots (HERE). Dynamic accuracy wasn't as good as the GPSmap 76, because the Pro records fewer automatic trackpoints as seen (HERE). The last graphic is an example of accuracy immediately after turn on explaining why 10 minutes is needed to acquire all the WAAS corrections before starting the recordings. In the Atlanta area, all Magellans we have reviewed can receive corrections from the AOR-East geosynchronous European EGNOS satellite. The units are permanently in the WAAS mode which can't (easily) be switched off. This will be a problem for users far outside the WAAS and EGNOS correction areas. For example, users in Australia have reported significant position errors introduced by receiving the POR satellite's WAAS corrections. For those that MUST deactivate WAAS, perform the following keystrokes (not approved by Magellan and may lock up the receiver): MENU, Right, Left, Right, Left. A "00" box appears. Rocker up to "03", Enter. Another Enter will deactivate WAAS. Esc, Esc, and then power off. (This is important; other keystrokes may lock up the unit). To turn WAAS back ON, rocker back up to "03" and press Enter. All later Magellan units have a feature called Automatic Averaging and results in the low drift rates and less scattering we recorded. This feature can't be turned off. According to the Position Page, automatic averaging kicks in when the velocity is less than about 1 km per hour. Before WAAS corrections are received, the message is "Averaging". With WAAS corrections, the display message is "WAAS Avg. ", and while moving, the message is "WAAS". One can reset the averaging by 'moving the unit around'. Next we took the units to a GPS control station surveyed by USInfrastructure, Inc. If we hadn't converted the survey datum from NAD-83 to WGS-84 (the datum for WAAS corrections), it wouldn't have been possible to determine the true accuracy of the Pro. It's widely thought that there is little practical difference in the two datums, but it amounts to 0.8 meters at the test site, and the accuracy of the Pro can detect the difference. For comparison plots, see (HERE). At this point, we wondered if the Pro had better accuracy than the Meridian Gold and Map 330. 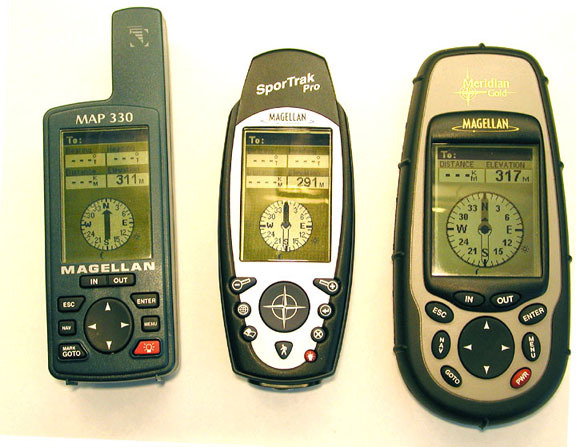 Tests with these units and a Garmin unit are shown (HERE). These units also met the 3-meter specification, even under tree cover. But the SporTrak Pro was still the most accurate. There is no evidence that the Pro, 330, or the Gold interfere with each other when placed together. The Pro uses two AA size batteries, and the manual says it has a 15-hour capacity with the backlight off. 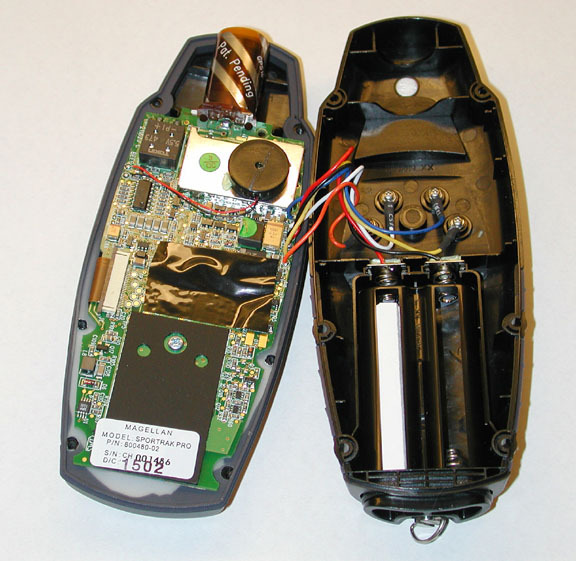 To replace the batteries, one must completely remove the battery compartment from the bottom of the unit. This requires a definite "tug" on the lanyard -after unscrewing the latch! The maximum number of trackpoints is 2,000. As with all Magellans reviewed, the tracklog connects points from separate logs no matter how far apart they are or if the receiver has been turned off between tracks. The Magellan Map-330, Meridian Gold and the Pro have the best backtrack in the business, because each and every trackpoint is used in the Backtrack. This Backtrack won't run you aground, as with the Garmins, because it does not cut corners when converting the tracklog to a backtrack. A Trackback can be converted into a route with a maximum of 30 routepoints. The tracklog detail has four selections; Off, Auto, Auto Detailed, 2.0 km, 1.0 km, 0.5 km, 0.2 km, 0.1 km, 05 km, and 0.01 km. The Road Screen provides a 3-D image of the Backtrack route, four selectable data boxes, and a compass ribbon. The road display is 'zoomable'. On the compass ribbon are four undocumented (as far as I can determine) symbols. There is an arrow which points to the direction you need to turn to stay on the Backtrack or Route. Then when you are heading in approximately the correct direction, a 'diamond' symbol appears which is the bearing to the next routepoint. Following the diamond makes traversing a backtrack or route much easier. The other two symbols are the sun and moon bearing. The sun and moon-bearing icons on the compass screen are a definite assist in orienting one's self while standing still. Any of the MapSend maps can exchange and display data from the Magellan receivers. G7ToWin has recently been upgraded to archive and edit data from Magellan receivers, including the Pro, and show it on Street Atlas maps. Ozi Explorer can also show the Magellan data on scanned and DRG maps. Street Atlas 8/9 can download waypoints, routes, and tracks from the Pro and also upload waypoints. When downloading routes, SA first downloads all the waypoints (also required by G7ToWin) -and then the routes. However, only with G7ToWin will the route legs on SA be connected by lines. One of the first things we noticed was that the case is held together with six screws. For those with 'insane curiosity' and need to look inside the unit, the picture below will save you the trouble. The case is well constructed with parts adequately sealed. Magellan says it meets the waterproofness specification of IPX7.